Zombie Suicide – Close up on me ! Shape : IDYLLE – Coming soon!!! Pants : NOCHE – Knit Joggers – Fatpack. By Askparis (NEW SPONSOR!!!!! *_*) Available in 10 different colors in a fatpack, with lace and metal options! four colors sold separately. Materials enabled. Head Skin Applier : EGOZY – Kamilla – Tan . 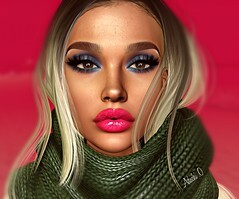 By Nicole Button /Ritamya Miles .New skin applier is available on marketplace including 3 eyebrows,6 lipsticks & 6 eyeshadows. Skin Applier : EGOZY – Included in the head skin applier!!! Shape : IDYLLE – Bento Shape for LILO MESH HEAD (CATWA). By Me Coming Soon!! !